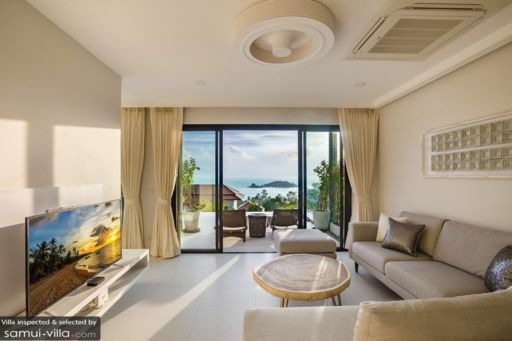 With sweeping views that pan across the azure waters of the ocean, Villa Klang is a three-bedroom holiday villa in Koh Samui with luxury interiors and modern conveniences. The villa offers a fine swimming pool area with outdoor dining and lush foliage that abounds around the property. The tropical gardens are perfect for early morning meditation amidst the fresh breeze and the blooming flowers for a positive start to your day. The bedrooms also overlook the panoramic vistas encompassing the ocean and the islands neighbouring Samui. Whether you’re travelling with friends or family, you are bound to have a wonderful time. The three bedrooms at Villa Klang offer sprawling sea views from framed-windows and are furnished with plush, king-sized beds for a comfortable sleep. Minimal décor and modern conveniences like air-conditioning and flat-screen TVs allow you to spend a lot of time just relaxing on your beds. The bedrooms lead to a private terrace that is also furnished so you can take your morning tea on the balcony while basking against the most gorgeous backdrop. The bedrooms come with ensuite bathrooms that are well-fitted with modern facilities so that you can get ready without any inconvenience in the morning. The infinity swimming pool at Villa Klang offers a great vantage point from where you can relish the splendid ocean and vast, blue skies. Relax by the pool with a fresh drink or coconut water under the tropical sunshine. Spending your day outdoors surrounded by luscious tropical flora is bound to put you in a good mood. There is a lavish outdoor dining area for an alfresco breakfast with your friends and family. A pool party is definitely in the charts so you can fire up with BBQ as well by asking the staff to set it up. A blend of modern and tropical living, Villa Klang offers spacious common areas where guests can relax and catch up with friends. The living area is found poolside for guests to be close to the outdoors at all times. Slide open the glass doors to allow a constant supply of fresh air to ventilate the living space or you can even crank up the air-conditioning if you wish to enjoy a cooler ambiance. Natural light streams indoors to highlight each and every part of the room. A smart TV is fitted into the living space so you can watch your favourite TV shows or movies all day long if you’re in the mood for a lazy day-in. 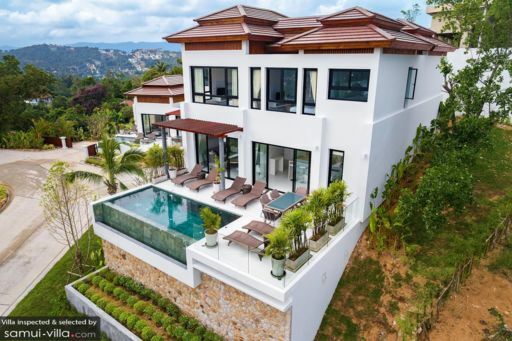 Also accessible from the poolside is the fully-equipped kitchen at Villa Klang which features pristine, white interiors and state of the art fittings. There is a breakfast bar with seating for six on modern stools. There are in-built appliances and granite countertops in the kitchen so you can have a feast. For a comfortable ambiance, the kitchen is also air-conditioned. Villa Klang has an entire team dedicated to make your stay memorable and keep you coming back for another vacation. The staff will help clean, manage and maintain the property and at the same time provide additional services to ensure you have more than the bare minimum. The estate is gated and secure round the clock so you have nothing to worry about. Massages, car rentals and a private chef are only some of the activities you can call for in advance. 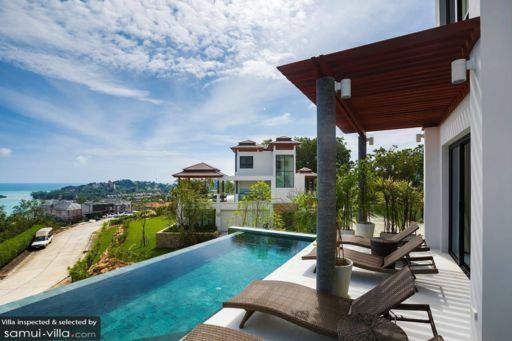 Villa Klang is located near the shores of Choeng Mon close to restaurants serving Thai delicacies and cafes seaside with splendid views. Thong Son Bay Beach is another secret hideout where guests can find a more deserted beach to relax however they wish. Ancient temples and sights in the area include Wat Plai Laem and Big Buddha. A few bars you can visit for a great way to end your evening include Q Bar and [email protected].